Myanmar is a fascinating and intriguing country, full of contrasts. Its people are warm, friendly and welcoming; it’s rich in archaeological sites and has areas of stunning natural beauty. Yangon, the gateway for most travellers, houses the awe-inspiring Shwedagon Paya, a gleaming gold zedi, and offers good examples of colonial-era architecture in a warren of historic streets. From here, you can visit Mandalay and the nearby fabulous temples of Bagan or take a trip on an old river steamer down the Ayeyarwaddy River. For the adventurous, there’s trekking around Kalaw and for the less energetic, Ngapali Beach is a great place to relax. 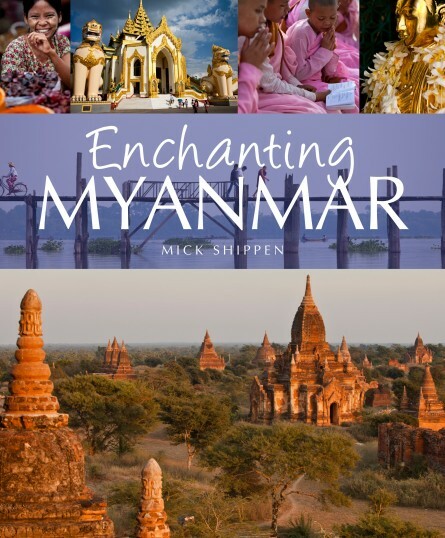 Enchanting Myanmar paints a portrait of this rapidly-changing country with informative text and brand-new images taken specifically for the book to introduce you to what will be a truly unforgettable visit. Mick Shippen is a freelance writer and photographer. Based in Thailand since 1997, he currently lives in Bangkok. Mick travels extensively throughout Asia conducting research for articles and taking photographs for local and international newspapers and magazines. A keen biker, he spends his spare time motorcycling and has toured extensively on and off-road in Asia. He is the author of two other titles in this series: Enchanting Laos and Enchanting Cambodia as well as The Traditional Ceramics of South East Asia.